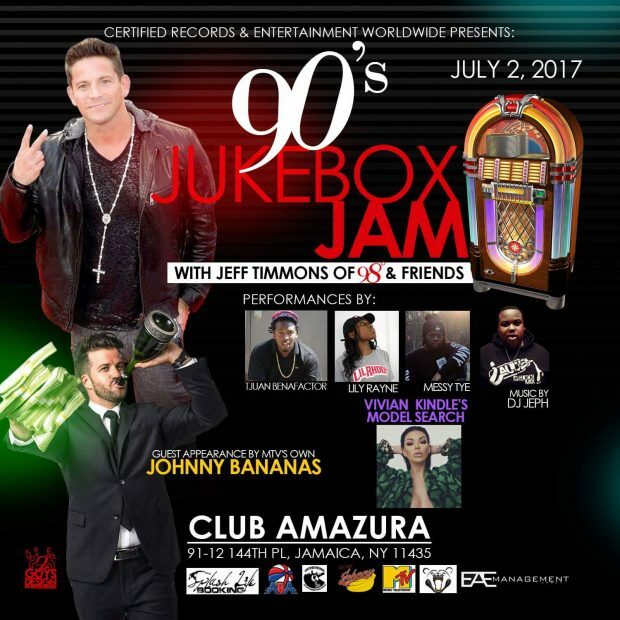 Jeff Timmons of 98 Degrees will be hosting & performing all night at Club Amazura for the 90’s Jukebox with Jeff Timmons of 98° & friends on July 2nd. The evenings event is presented by Certified Records & Entertainment Worldwide LLC and will be co-hosted by Layla & Lula from 103.5 KTU. Special guest performances by Tjuan Benafactor, Lily Rayne, Messy Tye & more. We will have live karaoke contest running all night with tons of different prizes so be sure to bring your best karaoke voice out. Johnny Bananas from MTVs Real World & The Challenge will be in the building helping judge the karaoke competition all night. 103.5 KTU will be broadcasting the nights events live on location! Come early, Stay late and have a blast with Jeff Timmons of 98 degrees. Tickets are on sale now, get your tickets online today & save! Previous Secret Fast-Trick Gets Instant Respect From Any Boss?